This article describes the Reverse Brainstorming method in a practical way. After reading you will understand the definition, meaning and basics of this powerful brainstorming and creativity tool. Old-fashioned brainstorming is a creative thinking technique that was first applied in the ’50s of the previous century. By discussing a problem or situation with a group of people, all manner of ideas are floated and people can encourage each other in this creative thinking process. Yet, studies show that our brain doesn’t always work that way. People often aren’t capable of showing creativity on command. As it happens, people tend to over-think problems first. Additionally, a brainstorming team always includes participants who don’t feel like participating, are having a bad day or are overruled by the more dominant participants. In all these cases, Reverse Brainstorming is much more effective. It’s another way of brainstorming. 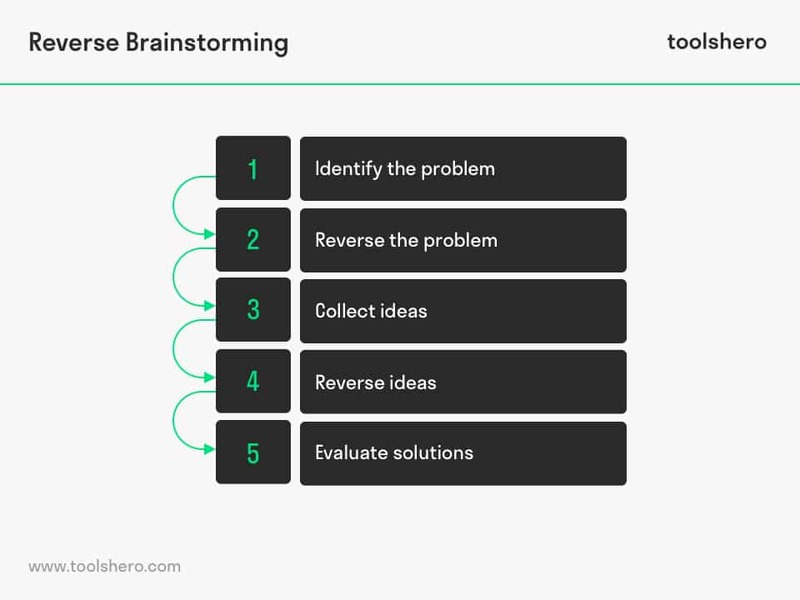 This reverse brainstorming technique can help to solve problems and leads to the development of creative ideas everyone participates in. It’s a technique to approach problems that initially appear difficult from a different perspective. This method is also known as ‘negative brainstorming’. Reverse Brainstorming can be applied for various reasons. For instance, when people have trouble coming up with good ideas quickly. It’s also possible that people have a certain opinion beforehand and have trouble letting this go when forming new ideas. Reverse Brainstorming can be helpful even when people have a tendency to approach a problem in a highly analytical manner. In addition to the ideas already present, this allows people to generate new ideas. By reversing the problem towards the cause, it becomes clear where solutions can be found. Generally speaking, people wonder how the problem can best be solved. In Reverse Brainstorming, though, it’s about looking at causes that could make the problem worse. This could give rise to absurd suggestions, which is in fact the strength of Reverse Brainstorming. This stimulates indirect thinking in the team, to arrive at innovative solutions and participate creatively. And this lead to ground breaking solutions. Identify the problem, describe it and note it down on a large sheet of paper, such as a flip chart, so it’s clear for each participant. Reverse the problem. So, don’t ask how the problem can be solved, but rather ask which causes could make the problem worse or how the opposite effect can be achieved. This is the step in which important information is generated. All ideas offered by the group to worsen the problem are usable. None of the suggestions can be thrown out. The ideas must flow freely and criticism isn’t welcome during this phase. All gathered ideas are now discussed and reversed to be transformed into real solutions to the actual problem. All solutions are now evaluated and the feasibility of those ideas is assessed. Jointly, the group decides what could lead to a real solution. For over a year, a commercial training institute that focuses on working people who want to get a vocational or college degree has been getting a lot of complaints. Most complaints are regarding the fact that the communication between the students and the training institute is so poor. Exams and resits are planned without any consultation with the students and the students’ preferred lesson locations are refused. This means they often have to drive over 50 km for a class. The student management has now planned a Reverse Brainstorming with members of the customer service, teacher management and marketing. The problem is defined as follows: ‘How can we improve customer satisfaction?’ Subsequently, this problem is reversed: ‘How can we increase the students’ dissatisfaction?’ That’s the basis of the Reverse Brainstorming process. Scheduling exams and resits for students without consultation, making it difficult for them to get the time off from work. Not scheduling students at their preferred location, but making them drive at least 50 km for a class. This results in a lively discussion, in which improvements are suggested in rapid succession. By putting themselves in the customer’s position, the student in this case, the team is better able to create good and feasible solutions. Additionally, they also understand the necessity and urgency of change, by viewing the problem from a different angle. Reverse Brainstorming is a good technique for creative problem solving. Just as in classic brainstorming, the number of the suggested ideas is important (quantity), rather than the initial usability of possible solutions (quality). Everyone can propose as many ideas as they want and each participant is encouraged to contribute. Every idea, no matter how good or bad, is welcome and ‘yes, but’ is not tolerated. Reverse Brainstorming is about looking at the opposite point of view. This provides new perspectives which can in turn lead to new, usable ideas. What do you think? Is Reverse Brainstorming applicable in your daily work? What is your experience with Reverse Brainstorming and other Brainstorming techniques? Do you recognize the practical explanation or do you have more additions? Galletta, D. F., Sampler, J. L., & Teng, J. T. (1992). Strategies for integrating creativity principles into the system development process. In System Sciences, 1992. Proceedings of the Twenty-Fifth Hawaii International Conference on (Vol. 4, pp. 268-276). IEEE. Souder, W. E., & Ziegler, R. W. (1977). A review of creativity and problem solving techniques. Research Management, 20(4), 34-42. Vieira, E. R., Alves, C., & Duboc, L. (2012). Creativity patterns guide: support for the application of creativity techniques in requirements engineering. In International Conference on Human-Centred Software Engineering (pp. 283-290). Springer, Berlin, Heidelberg.